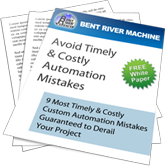 Bent River Machine’s building is located behind Verde Canyon Railroad. If you are looking for a relaxing trip through beautiful countryside, take the train. It winds up the banks of the Verde River past Indian ruins, bald eagle nests, canyons and cliffs hovering over the blue, rippling water of the Verde River. 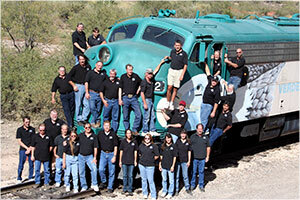 Here is the Bent River Crew on top of a Verde Canyon Railroad engine. 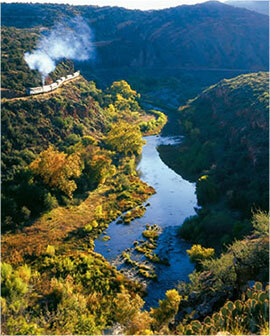 Bent River is located in the heart of the Verde Valley. We have a 9 hole golf course just up the road with many more courses to choose from. Sedona is 30 minutes to the North. Hiking and biking trails surround us. Mingus Mountain towers over the Bent River building with Jerome nestled halfway up its side. 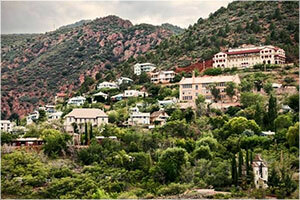 Jerome was once the largest city in Arizona and is now its most picturesque ghost town with many things to do. There are several wine tasting vineyards, museums, shops, and wonderful restaurants. East of Bent River is the Blazin’ M Ranch – home of authentic western B-B-Q and old time Cowboy music with other entertainment. Here is a picture of their shops and shooting gallery.